Canterbury is dominated by Christchurch, the largest city in the South Island. It grew to serve a large rural hinterland and maintains strong connections with its farming roots. 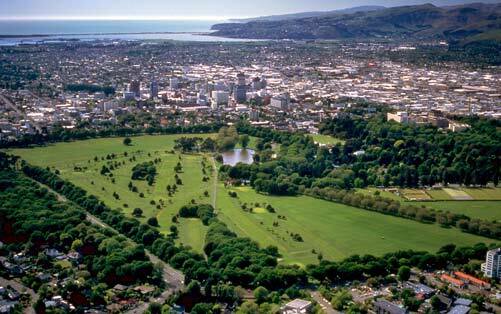 Known as ‘the garden city’, it became famous for its parks and green spaces, including Hagley Park (foreground). The city suffered severely in the earthquake of 22 February 2011, and many of the buildings shown in the centre of the city were demolished. Permission of the Christchurch City Council must be obtained before any re-use of this image.